The Gem of the Columbia. 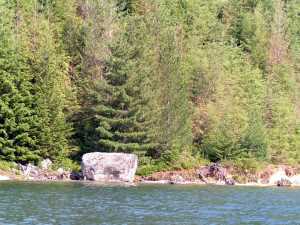 Nearby campsites: The Provincial Park has beautiful sites. When you find a more beautiful park in the North Country, we sure want to hear about it. Comments: Launch and boat parking are gratis. The ramp is easy, parking abundant, and it's the perfect place to begin a lake cruise. ------The boat thermometer registered mid-nineties. 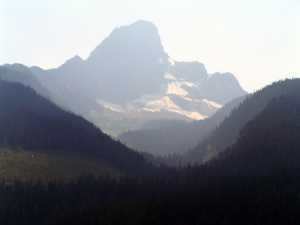 Ridiculously hot for the Canadian Rockies. The debate at Martha's ramp was short - "Sun's setting," Bill said. ------"Yep, but it's hot as the hinges, and likely to be so for hours," was El's reply. ------We were soon sliding down the ramp and Halcyon was in the drink. The shouts of kids swimming in the launch area encouraged us to think of a quick dip before departure, but the setting sun sent a more insistent message - Go! We went outta. ------Fortunately, the Park host, who came to witness our launch, told us there was a notch across the lake where we might be out of the wind. Squinting at the sky, he returned to repairing his ancient outboard, slowly shaking his head, after one more bit of advice - "And look out for the wind. She's a killer on this lake." ------It didn't take but a moment, after the activity of tying off, to discover that our new residence was air-conditioned. 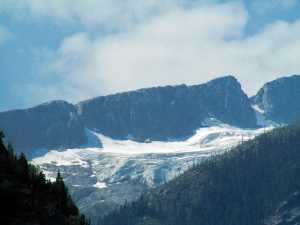 The notch was a crenulation that bent the Monashees all the way to the summit ice field. Almost visibly, frigid air was pouring down the crease. We bundled into parkas and huddled in the cabin while the trusty Wallas stove forced alpine air into a grudging retreat. We could still hear the squeals of children playng in the water at the Provincial Park across the lake, cooling off from the sweltering heat. Over the hum of the Wallas stove starting up, we could only hear our teeth chattering. 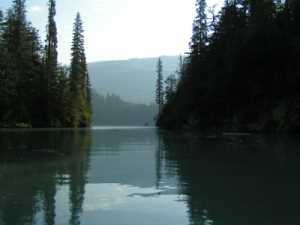 ------Kinbasket Lake lies 90 miles north from Revelstoke. It was created by the construction of Mica Dam, the highest earth-filled dam in North America. 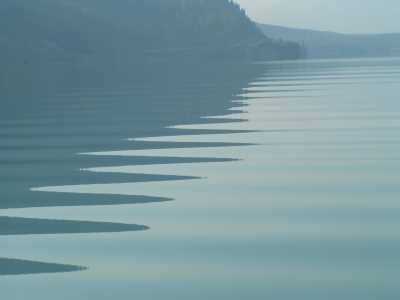 It backs up the largest storage of water on the Columbia system. Kinbasket is portrayed on our 'chart' as a seven-inch square of mostly white space. There's no fuel on the lake, no blacktop road access, no marinas, and nobody there. This summer, there is also no water. At least, the level was too low to use the one access ramp, so we had to give it a miss. 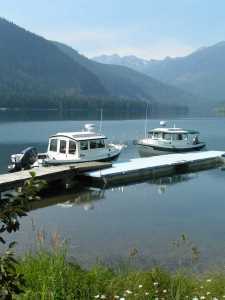 ------Lake Revelstoke is also described on the 'chart' with a inspiring string of negatives - "no marinas, no shore residents, no patrols, no fuel sales, few other users, and few places where boats can be beached." 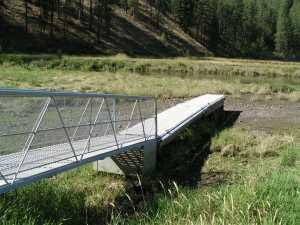 Other words are sprinkled through the brochure to describe the beauties of this lake - "sudden gusting winds can create rough water which can swamp even medium-sized craft" - "water is cold and presents a very real danger of hypothermia" - "the shoreline is unstable and small slides do occur" - "debris and dead-heads are present." All this is true - but they fail to mention the most significant hazard - the mesmerizing beauty of a wilderness lake. 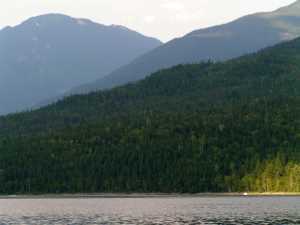 ------These lakes were created by BCHydro (with a healthy dollop of US money) to regulate the water of the Columbia River for power generation. Oh, sure, like most dams there is a string of other 'excuses' for spending millions and blocking off the flow of a river (and salmon) - flood control, recreation, agricultural diversion, etc. - but the real reason is for hydro power (and that's a good enough reason - those millions wouldn't have been spent just so Halcyon could float in the wilderness). There are fourteen main-stream dams on the Columbia and countless (at least, we didn't want to count them all - there are several hundred) dams on the many tributaries. The mighty main-stream dams are controlled by the Columbia River Treaty signed by the US and Canada in 1961. The main provision is that Canada must provide the US with 15.5 million acre-feet (an acre-foot is 325,900 gallons, so that's a mighty big swallow) of storage to regulate the flow of the river. In other words, if the US needs the water, Canada provides it. In return, the US paid for the storage reservoirs in Canada and Canadians gets a bunch of power from both Canadian and US dams. 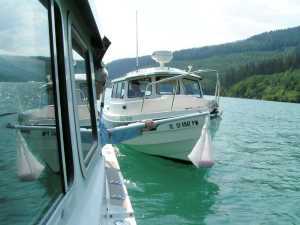 ------For lake cruisers, there are only a few critical considerations about this Treaty arrangement. First and foremost, it provides beautiful lakes for our cruising (and we're not going to get into the controversy over what these lakes have drowned, and the cultures and ecosystems destroyed by flooding a river - remember, in our former incarnation El and I were canoeists and river rafters [and three of my ancestors spoke Algonquian as their native language], so we appreciate the loss). 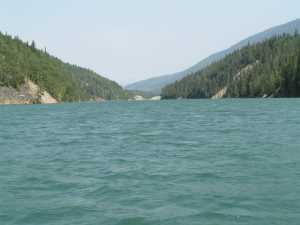 ------Secondly, as boaters on man-made lakes, it is essential for us to understand the difference between a "run-of-the-river" and a "draw-down" dam and reservoir. 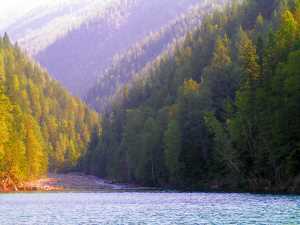 A "run-of-the-river" lake has no seasonal regulation. In other words, it varies little in it's water level. 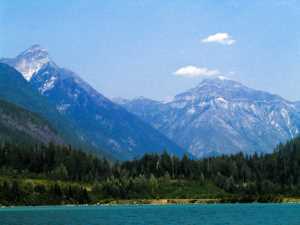 Revelstoke is one, and it varies only about 12 feet vertically in a year. 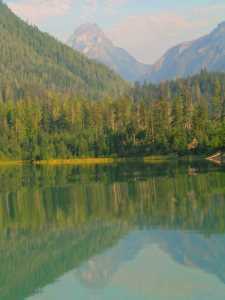 A "draw-down" lake is a storage pond, and if the water is needed lower down the river, any and all the water is released. Lake Kinbasbet is a draw-down reservoir, and in the winter it is virtually dry (we talked with folks who snowmobile through the Kinbasket Basin for trapping in the winter - they said it is virtually the original Columbia River flowing along a channel in a mud-filled hollow.) So, for us this summer, water storage in Kinbasket was drawn-down and the lake was rendered unusable for power boating. 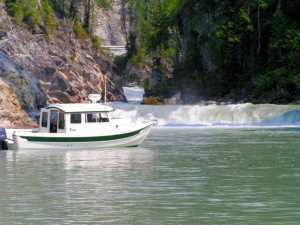 Revelstoke, the "run-of-the-river," was full. 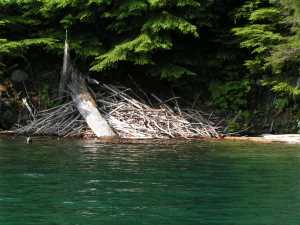 These beavers know Revelstoke is a run-of-the river lake or they would be high and dry most of the year. The Park Service hasn't figured out that Lake Roosevelt is a draw-down reservoir so this dock was useless this summer..
------At dawn, we kissed the lines, nodded thanks to the mooring trees, and turned the bow north. 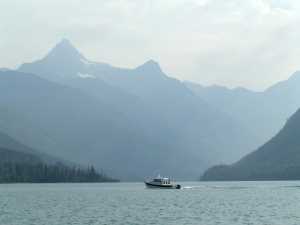 One hundred thirty kilometers of water stretched out between the mountains ahead of us, through some of the continent's most awe-inspriring scenery -- and all accessible by a boat on fresh water. The water surface rippled in the stillness, loons called, and glaciers crowned the highlands, nestling into cirques and cols far above us. It is too magnificent for words -- only pictures can depict the beauty -- and only personal experience can yield the uplifting joy of the solitude, the grandeur, the immensity of this landscape. The white dot on the water, before the slot, in the left photo is a C-Dory. The scale and beauty is overwhelming. ------Dramatic mountain geology was in our face. It wasn't always so. About 70 million years ago, when the last dinosaurs were exiting stage left, the landscape was gently rolling hills. However, the crustal plates that veneer Earth's seething interior, are a restless lot. The last dinosaur might have felt the shuddering earthquakes that announced the beginning of a new era for western North America. The Pacific sea floor plate, studded with volcanic islands and leftover pieces of continents, began heaving easterly against the North American Plate. The islands and continental remnants riding on the sea floor smashed against the continent and accreted to its western margin. The heavy sea floor plate, however, slid under North America creating enormous compression. Continents, like ice bergs, are composed of material less dense than the underlying molten material. They float high, but also like bergs, most of their bulk lies below. The subducting sea floor pressed against the continental basement, cracking, shattering and faulting it. Huge crustal blocks were thrust upward and westerly, against the tide of easterly-plunging sea floor. The Rocky Mountains are thus the heaved hunks of our continent, thrust skyward in resistance to plate collisions. 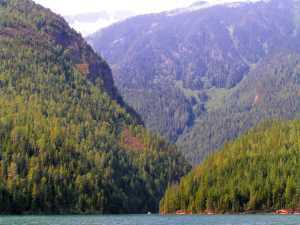 Today, lofty northwest-southeast trending ranges with deep intervening valleys extend from Alaska to Mexico as one of the most scenic cordillera in North America -- and we were boating through it! ------Mountains are impressive, but those that have undergone glaciation are spectacular! And these mountains have been carved by multiple glaciations. The latest continental glaciers receded only in the past 10,000 years. Remnant ice fields and glaciers still cling to the summits. Glaciers sculpt rock using ice knives to cut and imbedded rock and sand to scour, and what master carvers they are! ------Glacial ice fills a valley, carving the flanks as well as the base. This results in a u-shaped valley. Rivers, in contrast, scour only the base of their valley resulting in a v-shape. A quick glance reveals, to the knowing eye, the history of a valley. ------The water flowing in a stream can reveal its source. Glaciers grind and pulverize rock into particles so small that they are colloidal. 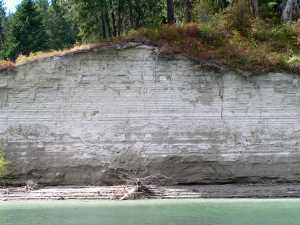 They don't naturally settle by gravity so the water is tan or greenish from the glacial flour it contains. 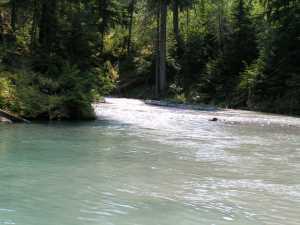 A stream without a glacier at its head, in this forested area, is clear. ------Ice is a heavy lifter -- glaciers carry massive boulders a thousand miles without modifying the shape of the rock. These rocks are called erratics, since they often bear no resemblance to nearby 'country' rock. 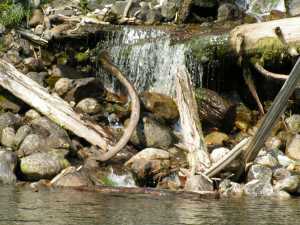 Running water also totes rocks, but in the process bangs them around and rounds off the edges. So, the shape of the debris may reveal the footprint of ice. ------Ice carves and plucks rocks headward up its valley. Most summits have three or more valleys descending their flanks. Consequently, glaciers ripping their way headward up those valleys often leave a remnant spire - a horn. 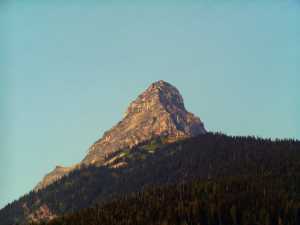 The Matterhorn is the classic of all horns, but there are many horns in the Rockies. Running water, in contrast, usually smooths a summit into a rounded shape. ------Ice does not discriminate what it carries - it hauls boulders, pebbles, sand and mud without differentiating them by size. Water sorts out what it hauls - with high velocity, everything goes, but as the current slows the big stuff is left behind in its bed and only smaller material can be carried. Finally, when the quietly meandering stream reaches a lake, only the finest muds are in suspension and these are deposited on the lake bed. So, glacial debris is unsorted by size and stream deposits are sorted. 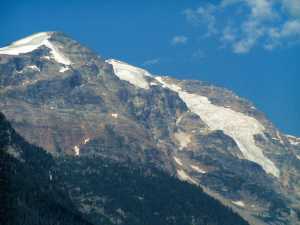 ------Alpine Glaciers flowed down the valleys flanking the Columbia River. During periods of major ice advance, they coalesced into a river of ice that flowed down the former river valley. The ice scoured out soil and rock, deepening the valley. 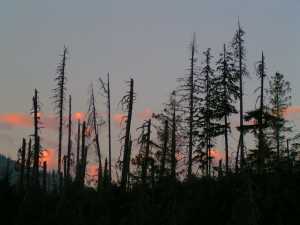 ------During the waning phase of glaciation, there was less snowfall, and thus less ice, to support the glaciers feeding into the Columbia river valley. 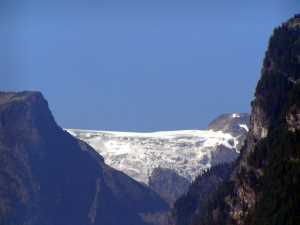 Consequently, while the ice in the valley glacier continued to move downhill (southerly), the terminus of the glacier retreated up the valley. For lengthy periods, when there was an equilibrium between the supply of snow/ice and melting, the terminus would remain stationary. 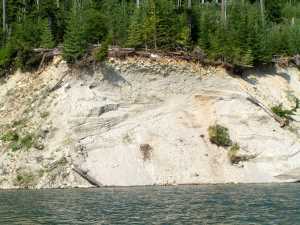 Glaciers carry an incredible amount of rock debris and this would pile up at the stationary terminus into a mound of unsorted sediment called a terminal moraine. 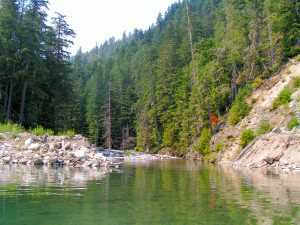 A terminal moraine blocked the southerly flow of the river, creating a temporary dam, near the Downie RV resort. 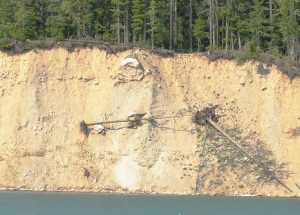 ------A huge pile of rock debris is on the move, down the west bank of the Columbia, sixty-five kilometers north of the dam. The Downie Slide last moved significantly 10,000 years ago, but could move again. BC Hydro has installed 14,000 meters of drain holes and 2,438 meters of drainage tunnels within the slide to stabilize and improve resistance to further sliding. The mass is instrumented to monitor movement and water pressure. The instruments are monitored 24 hours a day at several locations. A huge earth slide generated massive waves and destroyed a dam in Italy, with a large loss of life. 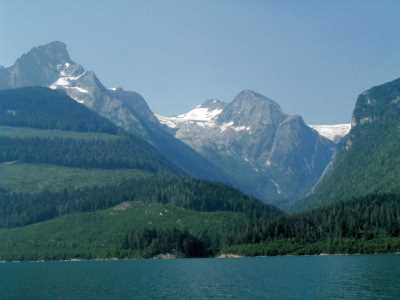 ------There was an ice lobe near the town of Revelstoke that dammed the southward flow of the Columbia River and backed up a glacial lake that was somewhat lower than the present day Lake Revelstoke. Ice makes a poor dam, so periodically the lake water would float the ice dam and it would be washed out draining the lake. However, during the next winter the ice would readvance and impond the river again. 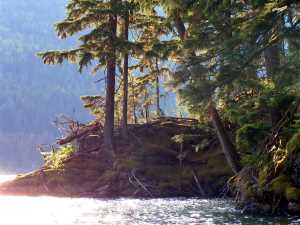 ------Death Rapids was a slot one hundred feet wide, through which the entire force of the Columbia River squeezed over massive rock steps, tumbling and roaring in a maelstrom of whitewater. 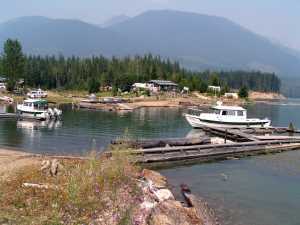 The town of Downie grew where the voyageurs paused and rested before or just after portaging the Death Rapids. No one ever survived a run through Les Dalles du Mort.